StabIe process reliability: The proven and future-proof components enable a reliable and reproducible process flow at all times. Compact design: The functional design of the process valves delivers the highest possible performance in small spaces. Reduced maintenance effort: Customer-specific part numbers standardise the supply of spare parts worldwide and reduce maintenance effort. Reliable quality: All Bürkert components are subject to strict quality criteria and regular quality controls. 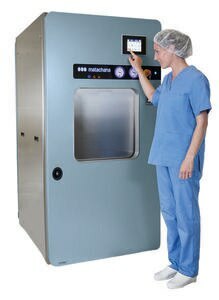 Matachana, based in Barcelona, is one of the world’s most important suppliers of sterilisers and autoclaves. As a valve supplier, Bürkert has been a close partner of the Spanish company for more than 25 years. Bürkert products are used in the autoclaves to regulate steam, vacuum and liquids. Matachana also relies on valves from Bürkert in its new steam steriliser. The Steam Sterilizer Series SC500/I is a steam steriliser that is suitable for application at Biosafety Level 3 according to Para. 10 BioStoffV. The steam steriliser features a state-of-the-art, highly effective control system. A 7” touchscreen with an integrated programmable logic controller (PLC) provides ergonomically sound access to measured values such as temperature and pressure. The condensate produced during the sterilisation process in the chamber and in the protective hood are contained in the lower interior part of the chamber. They are sterilised during the cycle with the help of steam pulses. Following the treatment, the condensate can be poured into the discharge outlet under sterile conditions. In order to guarantee optimal global service and constant availability, Matachana relies on strong partners with worldwide presence and spare parts availability. Depending on the actual demands, Bürkert Type 2000 or 2100 valves are used for the steam sterilisers. Type 2000 is a pilot-controlled angle seat valve. “This solution is ideal for handling dry-saturated steam, two-phase steam and also condensate,” says Luis Teres, Field Segment Manager Hygienic at Bürkert Spain. The proven self-adjusting chevron seal packing gland ensures good sealing for the applied steam overpressure and the vacuum condition. The valves achieve over three million switching cycles and are suitable for almost every pressure and temperature range. The Bürkert piston valves regulate, among others, the lower connection to the steriliser chamber. Before the actual sterilisation process begins, it must be ensured that all air has been evacuated from the steriliser and only pure saturated steam remains in the chamber. The angle seat valve from Bürkert is an ideal solution for monitoring this process. Efficient, effective and reliable sterilisation is only possible with pure saturated steam. If porous materials such as operating theatre and laboratory clothing are to be sterilised, even the air trapped in the textile pores must be effectively displaced. The most efficient technique for doing this is pressure pulsation. After the pressure pulsation phase comes the heating-up phase in which pure saturated steam flows into the closed sterilisation chamber until over 3,100 mbar and 134 °C are reached. After sterilisation, the pressure is released quickly in order to promote the drying of the sterilised material through the rapid pressure drop. The steam is evacuated by means of a vacuum pump and a condenser, during which it reverts to the liquid phase. In addition to the above mentioned angle seat valves, Bürkert supplies a modular body that allows mixing, distribution or multi-path functions to be combined in a very compact design. The modular process valve cluster Type 8840 has not only replaced conventional solutions, it also saves on piping work and fittings, reduces the number of sealing points and minimises the installation space required. By combining Bürkert valves with the valve cluster, many basic functions can be combined. When introduced through a feed line, operating media can be distributed to several consumers. Equally, flows from several consumers can be collected together. Different media such as hot and cold water or different chemicals can be mixed or distributed. Flow, pressure and temperature sensors as well as filters and non-return systems can be integrated directly into the modular process valve cluster.